President Bush signed into law yesterday the Genetic Information Nondiscrimination Act, which will become effective 18 months after enactment (November 21, 2009). The law prohibits employers, employment agencies, labor organizations, and health insurance providers from misusing individuals’ genetic information. Enactment of GINA has been expected for some time. The employment provisions will be enforced by the U.S. Equal Employment Opportunity Commission. The EEOC has been authorized to issue regulations within a year. Congress noted that genetic research has created “major new opportunities for medical progress,” but also that genetic information has been abused in the past. As examples, the congressional statement of purpose cites eugenics laws, which required sterilization of individuals with certain “undesirable” conditions, and laws that targeted certain sexes or racial groups for mandatory screening, such as laws requiring African-Americans to be screened for sickle-cell anemia. In addition, Congress expressed concern about genetic discrimination in the workplace and inconsistencies in existing laws regarding genetic information in the insurance and employment contexts. *The employer receives the information only in aggregated form. *Information about the manifestation of a contagious disease in a family member of the employee “that presents an imminent hazard of death or life-threatening illness” to a federal, state, or local public health agency, provided that the employee is notified of the disclosure. The statute explicitly states that GINA provides no cause of action for “disparate impact” – a facially neutral policy or practice that disproportionately affects a certain legally protected group. However, the statute provides for establishment of a commission six years hence “to review the developing science of genetics and to make recommendations to Congress rgarding whether to provide” such a cause of action. GINA does not limit the rights of individuals under more-generous state or federal laws, including the ADA and the Rehabilitation Act of 1973. GINA also amends the Employee Retirement Income Security Act, making it unlawful for group health plans or health insurance issuers offering group health insurance coverage to adjust premium or contribution amounts for the group covered because of genetic information. However, it is still lawful to increase premiums for employers based on the manifestation of a disease or disorder of an individual who is enrolled in the plan. Health insurers are also prohibited from requesting, requiring, or purchasing genetic information for underwriting purposes or before an individual’s enrollment under the plan or coverage in connection with such enrollment. GINA also provides that genetic information is “protected health information” within the meaning of the Health Insurance Portability and Accountability Act. GINA defines “genetic test” as “an analysis of human DNA, RNA, chromosomes, proteins, or metabolites, that detects genotypes, mutations, or chromosomal changes.” Analysis of proteins or metabolites that do not detect this type of information are not “genetic tests” within the meaning of the law. The foregoing is only a summary of GINA. For a copy of the statute, click here. 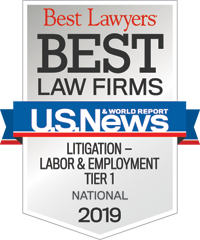 If you have specific questions regarding the application of GINA to your employment practices or health insurance programs, please contact any member of Constangy’s Litigation Practice Group or Employee Benefits Group, or the Constangy attorney of your choice.